Great rug for the price and the shipping was crazy fast! 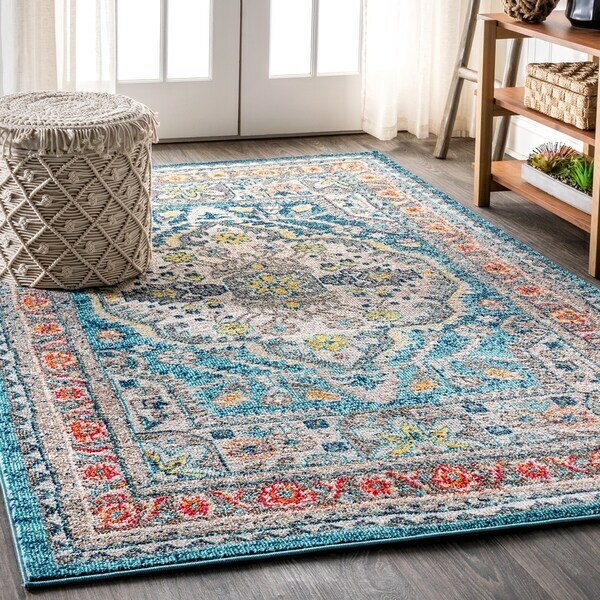 Old world style gets new life in a stunning aqua blue color in this bohemian rug inspired by the oriental masterpieces of antiquity. A large center medallion and thin border create an optical illusion that will make your space feel larger, all while creating a stunning accent for eclectic or modern decor. With only a 1/3'' pile, it is durable enough for high traffic areas like a living room or foyer, but soft enough for bedrooms as well. JONATHAN Y Bohemian FLAIR Boho Vintage Medallion Pink/Cream 5 ft. x 8 ft. Area Rug - 5'3" x 7'7"